I work with gene lists on a nearly daily basis. 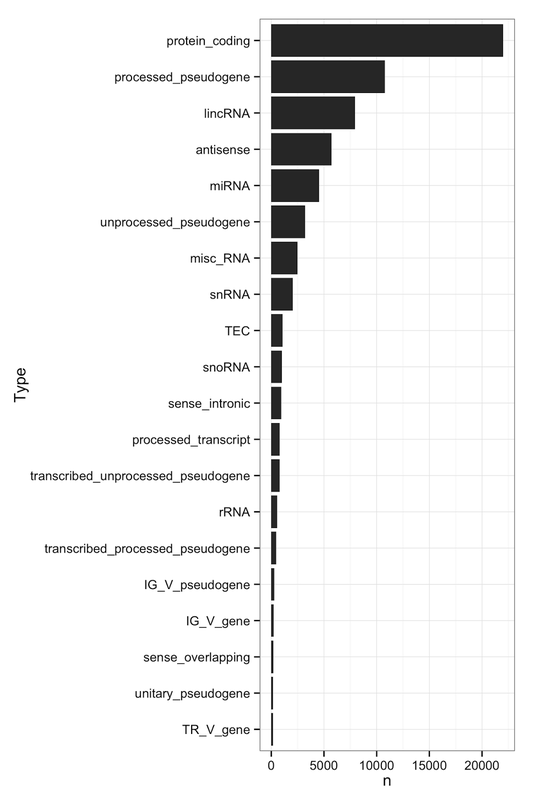 Lists of genes near ChIP-seq peaks, lists of genes closest to a GWAS hit, lists of differentially expressed genes or transcripts from an RNA-seq experiment, lists of genes involved in certain pathways, etc. And lots of times I’ll need to convert these gene IDs from one identifier to another. There’s no shortage of tools to do this. I use Ensembl Biomart. But I do this so often that I got tired of hammering Ensembl’s servers whenever I wanted to convert from Ensembl to Entrez gene IDs for pathway mapping, get the chromosomal location for some BEDTools-y kinds of genomic arithmetic, or get the gene symbol and full description for reporting. So I used Biomart to retrieve the data that I use most often, cleaned up the column names, and saved this data as an R data package called annotables. biotype: Protein coding, pseudogene, mitochondrial tRNA, etc. Additionally, there are tables for human and mouse (grch38_gt and grcm38_gt, respectively) that link ensembl gene IDs to ensembl transcript IDs. The package isn’t on CRAN, so you’ll need devtools to install it. It isn’t necessary to load dplyr, but the tables are tbl_df and will print nicely if you have dplyr loaded. This data can also be used for toying around with dplyr verbs and generally getting a sense of what’s in here. First, tet some help. Let’s join the transcript table to the gene table. Now, let’s filter to get only protein-coding genes, group by the ensembl gene ID, summarize to count how many transcripts are in each gene, inner join that result back to the original gene list, so we can select out only the gene, number of transcripts, symbol, and description, mutate the description column so that it isn’t so wide that it’ll break the display, arrange the returned data descending by the number of transcripts per gene, head to get the top 10 results, and optionally, pipe that to further utilities to output a nice HTML table. 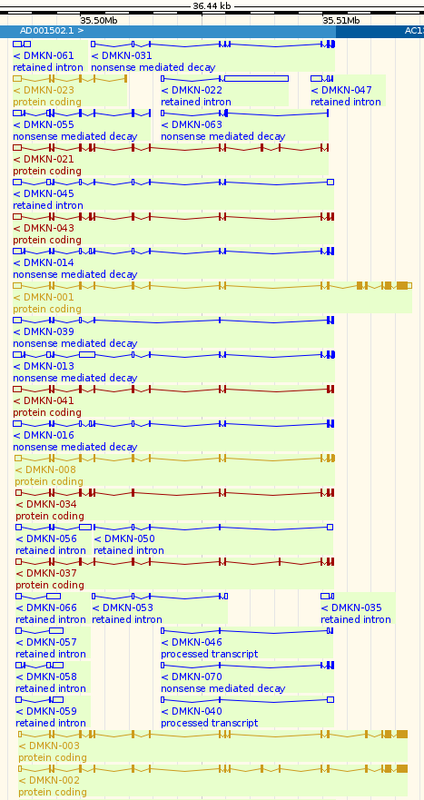 Let’s look up DMKN (dermkine) in Ensembl. Search Ensembl for ENSG00000161249, or use this direct link. You can browse the table or graphic to see the splicing complexity in this gene. Or, let’s do something different. Let’s group the data by what type of gene it is (e.g., protein coding, pseudogene, etc), get the number of genes in each category, and plot the top 20. This seems very relevant for my daily work. Just wondering - as I'm not as proficient with R - how can I best get b37 instead of b38 data for humans? And another type of question: does it matter when human annotations are b37 and mice than remain b38? Please open an issue on GitHub and I'll answer there, thanks. I like the use of dplyr etc since it's similar to how I like to work, but just wondering if you'd looked at AnnotationHub and also ensembldb and relaated annotation packages (eg EnsDb.Hsapiens.v75). The benefit of using these, which I think you're trying to get to, is that you're not dependent on a webservice in your analysis script, you just load the library and off you go, and you also explicitly state which version of ensembl you want to use.